Metabolic syndrome is a set of risk factors that includes: abdominal obesity, a decreased ability to process glucose (insulin resistance), dyslipidemia (unhealthy lipid levels), and hypertension. Patients who have this syndrome have been shown to be at an increased risk of developing cardiovascular disease and/or type 2 diabetes. Metabolic syndrome is a common condition that goes by many names (dysmetabolic syndrome, syndrome X, insulin resistance syndrome, obesity syndrome, and Reaven's syndrome). 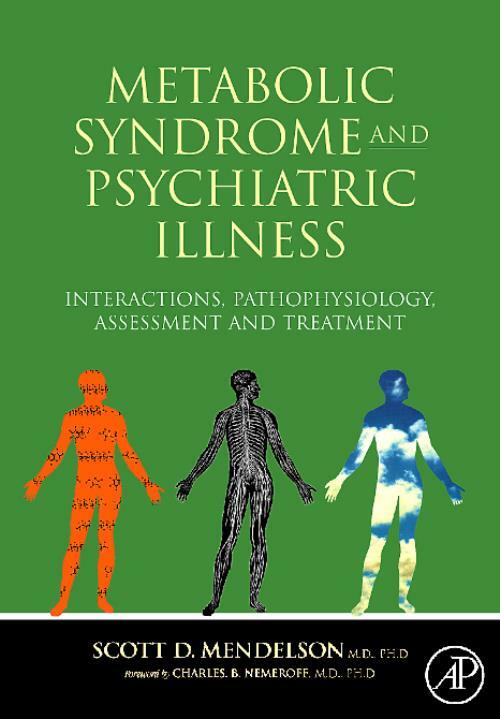 This is the first book to fully explain the relationships between psychiatric illness, Metabolic Syndrome, diet, sleep, exercise, medications, and lifestyle choices. Metabolic Syndrome is a major risk factor in Major Depression, Alzheimer's Disease, Sleep Disorders, Sexual Dysfunction, Fibromyalgia, and several other illnesses of psychiatric significance. Conversely, some psychiatric illnesses tend to predispose patients to Metabolic Syndrome. Of further interest is the fact that some of the medications used in the treatment of psychiatric illnesses have been found to cause or exacerbate Metabolic Syndrome. The author here provides basic information about what genetic predispositions, medical conditions, and lifestyle choices make Metabolic Syndrome more likely to occur. Among the contributing factors that are discussed are genetics, habitual intake of high glycemic index carbohydrates, fructose, saturated fats, trans fatty acids, vitamins, micronutrients, obesity, smoking, and lack of exercise. The author describes the actual mechanisms by which Metabolic Syndrome progresses and causes damage in the body, including the action of insulin and the pathophysiology of insulin resistance. Details are provided on what occurs in the liver, pancreas, muscle, fat cells, and immune system as Metabolic Syndrome progresses. New findings are presented on fat cells, including the fact that they are beginning to be considered as endocrine cells. There is a substantive discussion of leptin, which is one of the important adipocytokines. Also carbohydrate, 'bad fats', inflammation, oxidative damage, over-stimulation of the 'fight or flight' system, and high levels of the stress hormone cortisol can actually cause the manifestations of Metabolic Syndrome. These explanations set the stage for an explanation of the inter-relationships between Metabolic Syndrome, psychiatric illness, dementia and effects of not only diet and life choices, but also the effects of psychiatric medications. Finally, there is an important and unique section on the relationship between Metabolic Syndrome and various psychiatric illnesses, and how they exacerbate each other. The significance of Metabolic Syndrome in Major Depression, Bipolar Affective Disorder, Schizophrenia, fibromyalgia and Polycystic Ovary Disease is vast and it is important to realise the effects of psychiatric medications on Metabolic Syndrome. The author discusses antidepressants, mood stabilizers and the new atypical antipsychotics. There are dramatic differences among medications in the way they affect Metabolic Syndrome and pharmaceutical companies will want to promote patient awareness with this book.